I’ve stumbled on several quotes recently that juxtapose light and dark, their relationship to each other as a way of making sense of the darkness in the world around us. For me inspiration always comes from books, they are what I turn to in times of need; this one provided the lifeboat I’ve been searching for. These authors, (sidenote read more of their books), create another list of the books that inspired them. Maybe if you’re feeling stuck or depressed something here will be an antidote. Reading the Lev Grossman piece, I remembered how much I loved the Narnia books and are eager to revisit them. Each of the writers reveals a bit about their process, shedding light on the how-to of it all. Perfect for readers, writers or your favorite writer/reader person. If the broken places let the light in, I hope you find that it’s just enough to read by. Joe Fassler (Editor) is a writer based in Brooklyn. He regularly interviews authors for The Atlantic’s “By Heart” series. He is a graduate of the University of Iowa MFA program, and his fiction has appeared in The Boston Review and Electric Literature. In 2011, his reporting for TheAtlantic.com was a finalist for a James Beard Foundation Award in Journalism. He is currently a senior editor at The New Food Economy. Doug McLean (Illustrator) is an artist and illustrator based in the Boston area. He has an MFA in Visual Arts from Rutgers University and has been contributing drawings for the “By Heart” series since 2013. "Essays as intimate as journal entries." 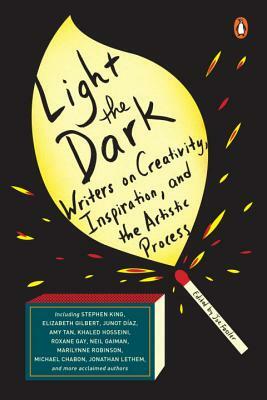 -Oprah, "The 18 Best Books to Pick Up This Month"
"[Light the Dark] delves into the various ways a powerful encounter with art can shape the creative process." -Poets & Writers, "Best Books for Writers"